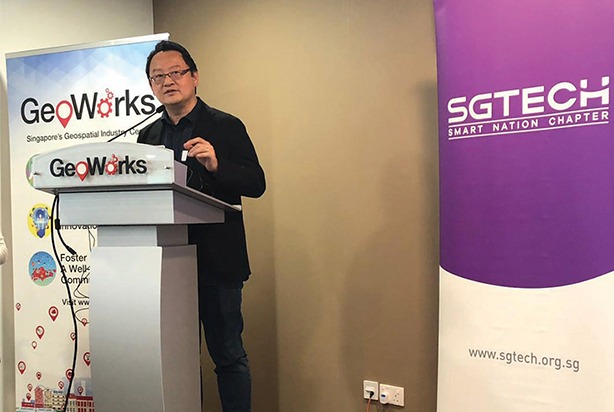 Elixir’s CEO and Chairman of SGTech Smart Nation Chapter, Mr Lau Shih Hor, opened the “Pitching for Smart Estate Partners” event on 14 Feb at GeoWorks. The SGTech event was held in conjunction with IMDA and Ascendas-Singbridge to partner innovative companies in developing Smart Estate Solutions. This is in support of IMDA’s Call for Innovative Solutions to initiate partnerships among tech and building developers for developing innovative solutions pertaining to Smart Estates. Present at the “Pitching for Smart Estate Partners” SGTech event was also Elixir’s Professional Services Manager, Mr Chen Ziliang, who did a pitch for Utility Management and Traffic Monitoring Challenge Statements based on our Ambience Business Analytics platform and tools. The salient points highlighted include our GIS map engine for customised Geospatial Analytics; dynamic Visualisation Components, Analytics Database and more!